Mirror ball throwing shimmering pieces of light all over the old brick walls. Music echoing, bouncing against the brick, concrete floors and ceiling pipes. Strobe lights flashing bright streaks into the centre of the dance floor. Groups of sweet-sixteen girls, in white jeans and sleeveless t-shirts, dancing, doing the hustle to “Car Wash”. Boys with mullets or “fros”, and platform shoes watching from tiny tables scattered along the perimeter, between slipping outside to have a smoke and a boot-legged beer. This was as exotic an atmosphere as one could hope for in our small rural town on a frigid January night. Some teenage guy had an extensive record collection, a decent stereo system, a few Radio Shack gizmos, and enough cash to rent out the basement of the “Old Brick School” to fulfill his vision of “Saturday Night Fever” with a $3.00 admission we were only too willing to pay. Fox stole, crinoline, satin and organza dresses, rhinestone jewellery, lace veil, and beaded drawstring evening bag; what more could a woman want? Or a little girl. My youngest auntie would dress me up in all this out-dated paraphernalia from some treasure chest in my grandparents’ house. I had no idea whose wardrobe and accessories these were to begin with, definitely not my grandmother’s as she was a plain dresser. I did not care; to me they were all mine! My Dad suspects they were left behind by Great-Aunt Lily who lived in California for awhile. 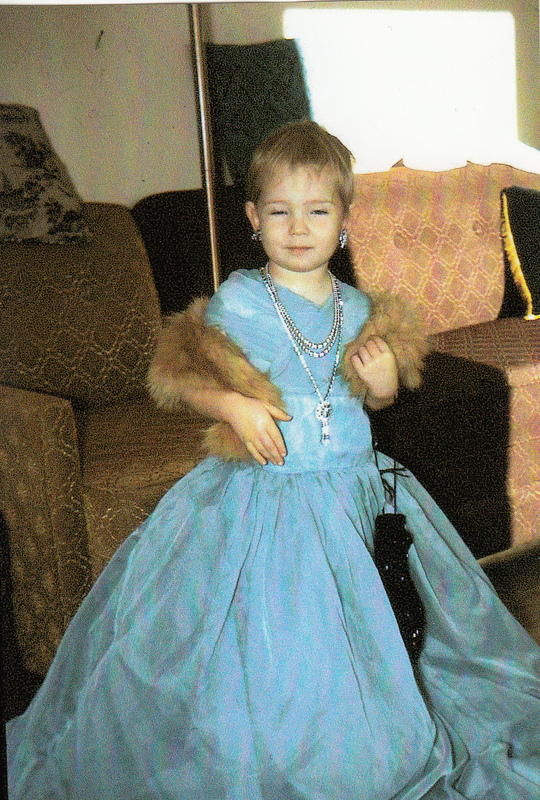 I was only about four years old when Auntie Louise and I started this fantastical game of dress-up, but I remember bits and pieces of it to this day. 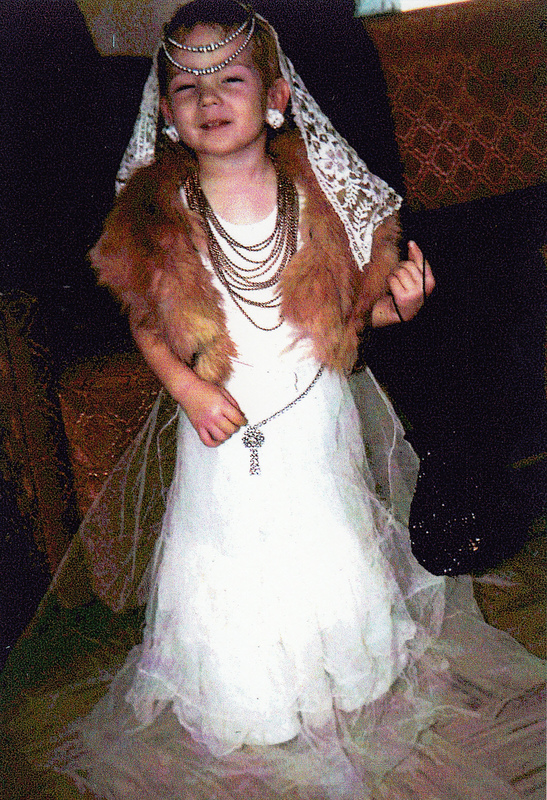 To my delight, a couple of years ago my parents found photos of me in splendid bliss as “the princess” and “the bride”. This is another piece of “Bite-Size Memoir” ( memoir in 150 words – no more, no less) a writing project initiated by Lisa Reiter. On my toes, a clumsy pyjama clad ballerina, neck stretched back, head tilted with mouth wide open trying to catch my balance and the bright light over the bathroom vanity long enough to see the back of my throat. Scratchy and raw for days I had an urgent need to see what was happening back there. Finally a glimpse; crimson with tiny thickened white splotches scattered about my throat. I was eleven years old; old enough to know it was not good. “Dad, look in the back of my throat. I think I have an infection.” I blurt out the diagnosis as I throw my head back to open wide in front of my Dad as he makes his breakfast. I convince my Mom to take me to the doctor, get antibiotics for strep throat, and begin my lifelong health vigilance. Opening up the white business envelope to see my first paycheque nestled inside was a thrill not to be forgotten quickly. Though minimum wage, it was still three times what I was paid for babysitting kids in our neighbourhood, which was one dollar per hour. I thought the salary was glamorous, but the work was not. I was one of six students hired to do janitorial work after school each day at my high school. Every day immediately at dismissal bell we headed over to the janitorial room to pick up our heavy industrial vacuums and rolling carts of cleaning products to get busy vacuuming classrooms, emptying wastebaskets, dusting, cleaning blackboards, and worst of all scouring the washrooms. The only real perk was the privilege of reading the graffiti on the walls of the boys’ washrooms before we had to wash it off, always hoping never to see our own names. This was yet again another morsel of “Bite-Size Memoir” initiated by blogger Lisa Reiter. Each week a prompt is given for a 150 word ( no more, no less) piece of memoir to be written. Four 14 year old girls dropped off on their own with an old green canvas tent at a campground thirty miles from home for the weekend. What could possibly go wrong? Apparently many things. According to my parents who absolutely forbade this camping excursion to happen unless they were to accompany us. My parents agreed they would park their RV several hundred feet away well out of sight. Dropping us off, we excitedly set up the tent, threw our sleeping bags inside, and opened our cooler to have a wiener roast supper over the campfire. How cool were we? Not as cool as at four a.m. when we woke in the pouring rain to discover we had set up the tent downhill from an incline, sleeping bag, and pyjamas soaked through. To their credit my parents never came to rescue us. Forty years have passed; I never tented again, ever. Legs moving as fast as possible, like pistons in a luxury sports car, arms pumping alongside. Chest straight and head tall until the very last second lean forward to anticipate the finish. Every boy hoping to be first in the sprints, the senior high elite events. “GO! GO! GO!” All the girls encouraging their favorites on the sidelines. Important to cheer on your hometown guys during the county track and field meet, but who could resist checking out the boys from all the neighboring towns who came to compete too. It was the seventies. Short shorts and mullets were everywhere. It was just a matter of deciding who you thought was the cutest guy of all. There were stars, easy to pick out by red first place, and blue second place ribbons pinned on the front of their t-shirts. The losers sat sunning themselves bare-chested, they were definitely noticed too. Women’s Words writing week has been like looking through a kaleidoscope. I look in and see so many different pieces of color. Emerald green, cobalt blue, “yellow like the sun” as my toddler son used to say, scarlet red, a dark purple hue like the shadow of a prairie sunset, the true orange color of a sun ripened mandarin fruit. I do not see black or white, nor any shades of grey in any space, just total vibrant color. Tiny shards and specks tumble. Chunks of color; blending, falling, rising, moving, changing places. Different permutations and combinations, all coming together in turn after turn of enchanting energy. Gorgeous, vibrant, ever changing patterns. Captivated by the strong yet gentle, courageous women surrounding me, I am entranced. I am fascinated by the power in their spoken words, their passionate voices. I am grateful to be here, to be present, to have heard. 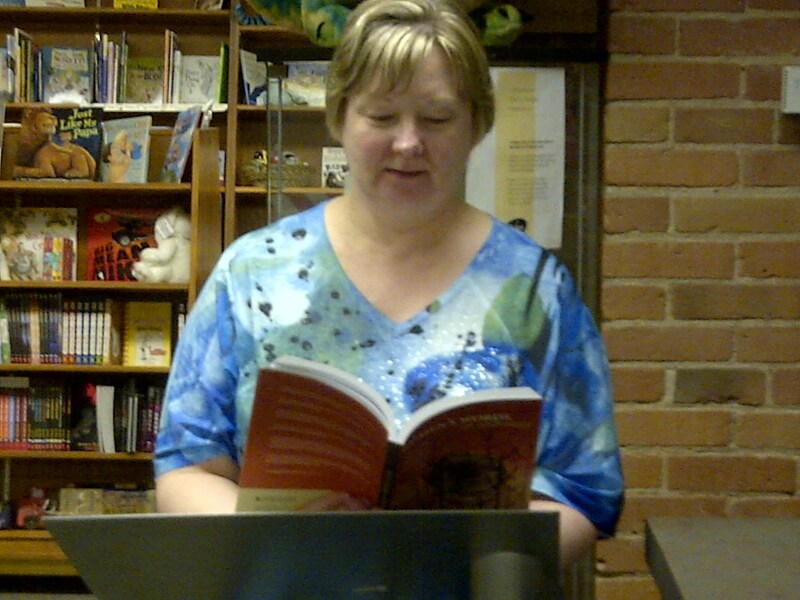 Women’s Words was a week long writing workshop initiated by Eunice Scarfe. It was held at the University of Alberta Faculty of Extension in Edmonton for 20 years. Last year was the 20th anniversary. I was honored to have a piece of writing selected last year for the 20th anniversary anthology published to celebrate women’s writing. There will be no Women’s Words held this June. I do not know why. Today, I was thinking about the week I spent there several years ago. It inspired me to write about that week as a 150 word (no more, no less) bite-sized memoir. Women’s Words was pure magic, no fairies required. “Jinks & Japes” – No Substitutions Please! Although hot summer days were the best for mud cookie baking, they often presented another problem. Water was needed to mix with the dirt, and if it had not rained for awhile there were no puddles available to scoop water out of. My Dad had always strictly forbidden me to touch the outside tap. I remember being faced with the no water predicament one day. I got the idea that we could pee into the bucket. We’d use pee to mix the cookies. My friends agreed this was a brilliant idea. We hid under the back stairs out of view to empty our bladders into the sand pail. Carrying the half filled pail carefully, we proudly headed to the road to mix in the dirt; then bake on the concrete sidewalk. This week’s topic was “School at Seven”. I missed her deadline for compilation but decided to do it anyway to warm-up for next week’s topic which she will publish tomorrow. I am curious to see if I will find this writing just as delicious as those bite-size muffins I was woofing down from the market all summer! I entered the grade two class of Miss Dari at St. Paul Elementary School in 1968. Her classroom was on the east side of the “old grey school”, the single story wing attached to a brand new two story wing for the older kids. The “older kids” were grade four and five. My Mom was up there too, teaching grade five. I have few memories of particular activities and lessons in the classroom. However, strangely enough, I have a very vivid recollection of the very first word list lesson in the little hardcover Macmillan spelling text book. The first words we had to know how to spell that year were: the, is, not, cat, cow, car. And they were in that exact order. I would challenge any psychotherapist or neuro-psychologist to explain to me why that spelling list remains embedded in my memory to this very day.